Women’s Excessive Facial Hair Growth - there’s no need to suffer! Excessive facial or body hair in women is a condition called hirsutism. Hirsutism either runs in the family, usually presenting at menopause and puberty, or it can be an indicator of a larger underlying problem. Research indicates that up to 10-12% of the Australian female population is affected by Polycystic Ovarian Syndrome which can be linked to excessive hair growth and hirsutism. Hereditary hirsutism is largely an aesthetic rather than a health concern. When not hereditary it is most likely the result of excessive male hormone production (adrenal virilism), or an increased sensitivity of the hair follicle to normal male hormone levels. It is important to both a woman's health and her self-con dence to have this condition diagnosed by a doctor. Hirsutism and any hormone imbalance that may underlie this condition can be treated. Excessive facial and/or body hair can be managed. Electrolysis is one means of managing excess hair but this can be painful, slow and very costly requiring many visits as only one follicle at a time is usually treated by sending an electrical pulse down the hair shaft. Laser hair removal (as distinct from the much less effective IPL) is a much more manageable maintenance procedure as it treats a larger number of follicles at a time, is more comfortable than electrolysis and provides fast effective treatments. 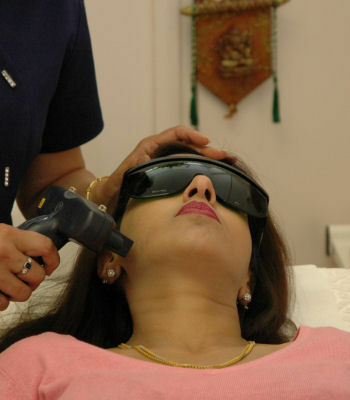 Hormonal hair growth via Laser Hair Removal therapy is efficient and manageable but not always a permanent solution as it is likely that hormonal hair regrowth may occur although usually at a much slower rate and usually much thinner than before, so hirsutism sufferers should be wary of claims by any service provider that they will achieve a permanent solution. A woman might consider bleaching her facial hair, which makes it less visible alternatively regularly waxing can also assist. All of these methods should be used as means to treating the symptom, but any woman with progressing hirsutism should consult a doctor for a diagnosis in order not to compromise her health, or her self-confidence.